Students at Yorktown are constantly stressed. It is no surprise that high school students face stress. These four years of a teenagers’ life are meant to prepare them for what is to come; therefore, feeling stressed is expected. It is a natural emotion everyone experiences, and it can even be interpreted as a positive motivator. However, for high school students across the county, it is becoming a real problem. Having panic attacks, hours of homework and the constant pressure of being perfect is common for students at this school. While Arlington Public Schools (APS) is a highly regarded school division, it is no secret that comparison culture, excessive stress and competition between schools exists in excess within the county. Regardless of school district, the ever-present idea of college is constantly on high schoolers’ minds, which further contributes to a feeling of anxiety. The pressure to overextend oneself outside of school can be felt throughout Arlington. For junior Jackie Kabiri, Advanced Placement (AP) classes, varsity sports and volunteer work are just three of the many responsibilities Kabiri is stressing about on a daily basis. Since extracurriculars are essential to building a strong college application, it is not rare for students to overbook themselves with sports and clubs. “There are just really high expectations. Not only do I worry about doing well in school, but I also feel like I need to be doing a lot of other activities and extracurriculars. I especially feel like I need to be doing all of these things just to get into a good college. I overbook myself a lot,” Kabiri said. 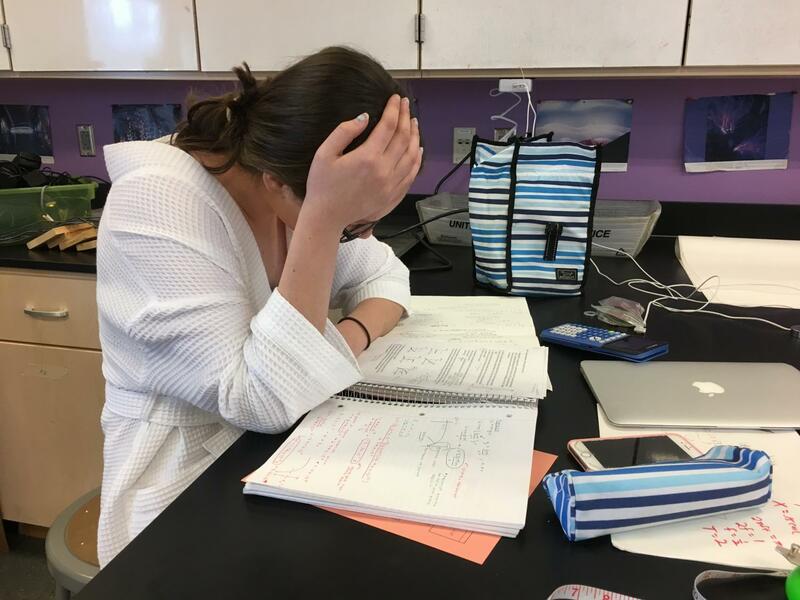 While it is fairly common for juniors in high school to feel excess levels of stress due to a heavy class load, underclassman throughout Arlington have also begun to experience increased anxiety. Although younger students may not be taking AP-level classes, they still feel the pressure to outperform other students. Frankly, the stereotypical level of stress a junior experiences is now starting as early as freshman year. While freshman Yasmina Mansour is new to this school, she is already familiar with high school stress. “As a freshman, I feel stressed for the majority of the time. My stress stems from pressure to excel in school, and in extracurriculars. I feel as though from a young age the Arlington school system has instilled in me and my peers the desire to continuously have straight A’s. This mindset causes me a great deal of stress because I push myself until every assignment is perfect,” Mansour said. APS is often criticized for creating a high stress environment in its schools. Counselors Carolyn Kroeger and Jeffrey Stahl both have experience working in Fairfax County before coming to work here, and can help shed a light on what school atmospheres are like outside of Arlington. “I was a counselor in Fairfax for nine years at a school before I came here. I will say, I think what I see here is very similar to what I saw at the other high school. I think a lot of [it is] academic stress, and a lot of stress related to college […] My personal impression is that the Northern Virginia area is a more stressful area. Yes, [stress] is pretty common in a high school, but this area lends itself to be a little bit more stressful. Yorktown has a high achieving population with lots of awesome kids, but that being said, it does create a level of stress, which is totally understandable,” Stahl said. “I feel like [the increased stress] is Northern Virginia in general. I have worked a little bit in Fairfax County, so I have seen both. It does also depend on the school, but I think in Northern Virginia, students have more opportunities. Because of that, there is more competition between students to get into more competitive schools,” Kroeger said. As a counselor here, Stahl often speaks to his students about their stress issues. According to him, a combination of different pressures often leads to an increased amount of stress. Especially in such a high performing area, these expectations can add up. Wakefield and Washington-Liberty (WL) are two other high schools in the area who are also experiencing a rise in academic and personal anxiety. “When you have students trying to figure out what college they are applying to, I think students naturally compare themselves to each other. I just think you combine that with academic stress, AP classes and having to take SATs, it’s a lot to think about […] It seems like at all three high schools there are a lot of students dealing with mental health issues, and we have seen increased numbers of kids with anxiety. I think that stuff just comes from the high level of stress,” Stahl said. Kroeger and Stahl have helpful advice for any students who are currently struggling with stress problems. Overall, they both want students to remember there is more to life than high school. “Focus on yourself. Don’t worry about what everyone else is doing, worry about what’s going to be best for you […] Just try not to compare yourself to what everyone else is doing, because the bottom line is, everyone is going to graduate from high school, everyone is going to find something they want to do after high school and everyone is going to be fine. Yes high school is important, but at the end of the day, everyone will move on and do something else,” Stahl said. “There is a lot that’s out of your control in high school. You can do your best in school, but other things are going to come up. All you can do is your best, and nobody is perfect. Also, everyone is unique and have their own individual strengths, so don’t always compare yourself to your friends,” Kroeger said. Needless to say, APS students are under an immense amount of stress for a majority of their high school career. Whether this is specific to the Arlington area, or is common throughout all school districts, stress culture is becoming a problem. Here at Yorktown, there are many places to look for guidance if you are feeling overwhelmed by school or other outside stressors: counselors, teachers, school social workers and fellow students.